For the first time, actual Presidents and Prime Ministers of 12 powerful countries will meet behind closed doors to seal an extreme Internet censorship plan called the Trans Pacific Partnership (TPP). 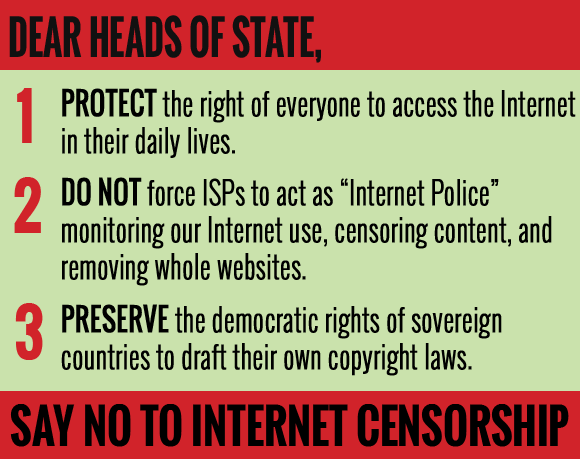 We know from leaked drafts that the TPP will make the Internet more expensive, censored, and policed. Experts say, “kids could be sent to jail for downloading” and whole families could be kicked off the Internet. This final meeting is happening in a few days — Send decision-makers these three demands by filling out the form on this page before it’s too late.